St. Peter and the other Apostles are commonly blamed for returning to the practice of fishing after our Lord’s Resurrection: As though this were a relapse to their old way of life, a return to their “pre-conversion” days. While Jesus had once commanded Peter to catch the fish so as to pay the tribute – Go to the sea, and cast in a hook: and that fish which shall first come up, take (Matthew 17:26) – the Apostles do not seem to have been generally distracted with the business of fishing during the roughly one year and an half in which they accompanied the Lord in his public ministry. Furthermore, as the common interpretation goes, our Savior had explicitly told Peter that he would no more catch fish but would be only a fisher of men when he stated, Come ye after me, and I will make you to be fishers of men (Matthew 4:19) or again, Fear not: from henceforth thou shalt catch men (Luke 5:10). Therefore, it would seem that St. Peter and the other Apostles sinned by relapsing to their former ways when they went fishing at the Sea of Galilee after our Lord had risen from the dead. Rather, they should have been “fishing for men” through preaching the Gospel to all peoples. This, however, is radically contrary to the way that all the great saints and theologians have interpreted the passage. 1) The Lord did not remain always with his Apostles after his Resurrection, but only appeared at certain times and moments. Therefore, the Apostles were not neglecting the Risen Christ when they went fishing. 2) The Apostles had not yet received the Great Commission, Go therefore, teach ye all nations; baptizing them in the name of the Father, and of the Son, and of the Holy Ghost (Matthew 18:19). Rather, they had been told by the women that Jesus said, Fear not. Go, tell my brethren that they go into Galilee, there they shall see me (Matthew 18:10). In other words, it was the express command of the Lord that they should return to Galilee rather than go out to the ends of the earth. 3) Fishing is not a sinful occupation, but is a valid means of supporting oneself and earning one’s bread. In a time of necessity, there was no sin that St. Peter and the others should fish so as not to starve, even as St Paul supported himself in his missionary travels by making tents. 4) Finally, it is indeed most praiseworthy that the Apostles should have supported themselves through the labor of their own hands, as there were at that time no great number of believers to support them and they should not have burdened the few women who knew of the risen Lord by requiring these few to support and care for the eleven as well as for the other disciples who awaited Jesus’ appearing. 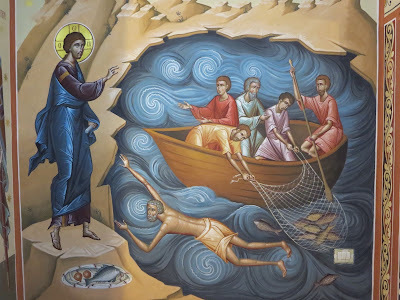 Considering the passage from St. John’s Gospel as a whole, it is clear that the Apostles did nothing wrong in returning to the practice of fishing. 1) Unlike many other post-Resurrection scenes, when Jesus appears he does not in any way chastise the Apostles or rebuke them for their lack of faith. How striking this is! Nearly every other time that Jesus appears to the Apostles after the Resurrection, they are explicitly said to be of little faith or slow to believe – but, here, nothing! No reprimand is given. 2) When the Lord does appear, he does not demand that the Apostles cease their labor, but rather tells them to continue fishing (only on the right side of the boat). If the fishing were sinful, Jesus would not have commanded St. Peter and the others to continue. 3) Furthermore, the efforts of the Apostles are blessed with a miraculous catch of 153 fish [for more on the significance of that number click (here)]. Clearly, the fishing of the Apostles has been approved by the Lord through this great miracle – sinful activities are not confirmed by miracles. St. Peter followed the command of the risen Lord to return to Galilee and to wait there for an apparition. When the Prince of the Apostles reached the place where he had been called to follow Christ, he returned to the practice in which he had heard that vocation. Having been called from the fishing boat, and since the employment of fishing is itself a good and praiseworthy task especially given the necessity of supporting himself and the other disciples who were waiting for Jesus, St. Peter again returns to fishing knowing that the Lord will come to him on the sea-shores even as he had before. Those who have had the privilege of making a pilgrimage to Galilee will likely have noticed that the church which commemorates the miraculous catch of fish is located very near the only major inlet to the sea. It is suspected that this inlet was the common place where fishermen of that region would wash their nets (since running water greatly facilitated this project). Therefore, it is no stretch of the imagination to suppose that this place where St. Peter had returned to fish was the very place in which Jesus had called him while he was cleaning his nets and established him as a “fisher of men” (cf. Luke 5:1-11). In other words, St. Peter is not backsliding or relapsing in this passage, rather he is returning to the place where he had received his call as an Apostle! He is going back to the beginning, back to Galilee, back to where he had once met Jesus (though, of course, he had first come to know the Lord even earlier while a disciple of St. John the Baptist). Having returned to the beginning, St. Peter did see Jesus, just as the Lord had told him he would. Thanks, Father. I have noticed that nearly every time I hear this Gospel, the default starting point in the homily is that St. Peter was doing something wrong. While I perhaps can see the attraction of such a starting point, I never understood it, really, and began to think it was another way to impugn the Apostles as ignorant, bigoted, incompetent fisherman. Yes...maybe he was just hungry. I would think it a miracle that Peter and the others even went back to fishing considering the crucifixion and the resurrection of Jesus. They were probably still under suspicion by both the Sanhedrin and the Romans. Maybe the previous encounters with the risen Christ gave them the courage to try to get back to some type normalcy in their lives. Good to have you back Father! What might the moral sense of this passage be, do you think? Apparition may not be an accurate description of this appearance, this fishing appearance was after the resurrection but before the ascension so it was a unique resurrection appearance. Saint Paul could describe his encounter with the risen Lord as an apparition since it was after the ascension. I know splitting hairs. Great article! I always saw it as Peter deciding to calm his nerves by doing what he did best instead of sitting fearfully in a locked room. Thank's so much for that explanation Father. I have found it a puzzling episode knowing that Our Lord had appeared to them a number of times before, and seeing some sort of defeatist attitude there. After the Resurrection that wouldn't make sense. Points 1, 2 and 3 are all make perfect sense and are very enlightening and help us understand much better what was going on and lead to the logical conclusions you draw. I will bookmark this page for sure. Anonymous (April 13), Please use a pseudonym when you comment. One note regarding the appearance to St Paul -- It in fact is the same quality as the other post-Resurrection appearances to the other apostles. This is why St Paul is a true Apostle, because in a wholly miraculous and unusual way, Jesus appeared to St Paul in JUST THE SAME WAY that he had appeared to the others, even after the Ascension. In other words, the Lord returned to earth for that appearance! This will not happen again until the end of time! Hello Fr. Erlenbush. I am so glad to see you and your blog back. It is so edifying for us. God bless you. And...still had time to count the catch! "Simon Peter went up, and drew the net to land, full of great fishes, one hundred and fifty-three." Several years ago I was wondering what all this Galilee stuff in the various gospel resurrection accounts was about. "Why Galilee?" I wondered. This was around Easter time. Just so happens the Pope, Francis, right around then gave a wonderful homily which I was fortunate enough to hear, explaining Galilee just the way you have explained it here: the Lord was telling them, and us, to return to the beginning, where we first met Christ, where we were first called, and etc. We each have our own Galilee.